6 y 7 de Septiembre de 2012. Facultad de Bellas Artes de Barcelona. Sala de Actos. According to Sigmund Freud, hysteria’s symptoms meet two conditions: the past and the very actual moment – “it all goes back to remembering”, Freud once stated. Known as a (female) disease for ages, hysteria became a subject of medical and neurological research in the second half of the 19th century. Modeled on the representations of the obsessed in art and supported by huge amounts of so-called scientific or clinical photographies, the theatrical and aesthetic phenomenon immediately drew the attention of scientists and artists alike: Examining and depicting hysterics had become the two sides of the same coin. Beginning with, what the French art historian Georges Didi-Huberman called the invention of hysteria at the end of the 19th century, the talk will criticize any ontology of being hysterical, especially when ascribed to women. Instead, it looks at hysteria as a (creative) method in which research, media material, and the imaginary are intertwined. It proposes its contemporary revision as a set of means and methods to subvert and to disarray institutions of all sorts: subjectivity, the arts, and the sociopolitical. The question today that stays for art and theory, the social and the political is the question of the social bond and our place inside it. Are we capable of action, critical analysis, resistance, or better to say insurgency? If yes, how? What is the social bond that structures neoliberal global capitalism? How to talk about ideology, subjectivities, power and life, if it is said that we live today in the world of the post-ideology, post-politics conditions. The lecture will try to rethink these questions and as well confront two conceptualizations of mode of life, on one side the biopolitical and necropolitical and on the other the Lacanian four discourses, in order to answer to the main question of our capacity to react and moreover change these present conditions of capital over-exploitation and dispossession. 10:30-13:00h Presentación videos de Marina Grzinic. 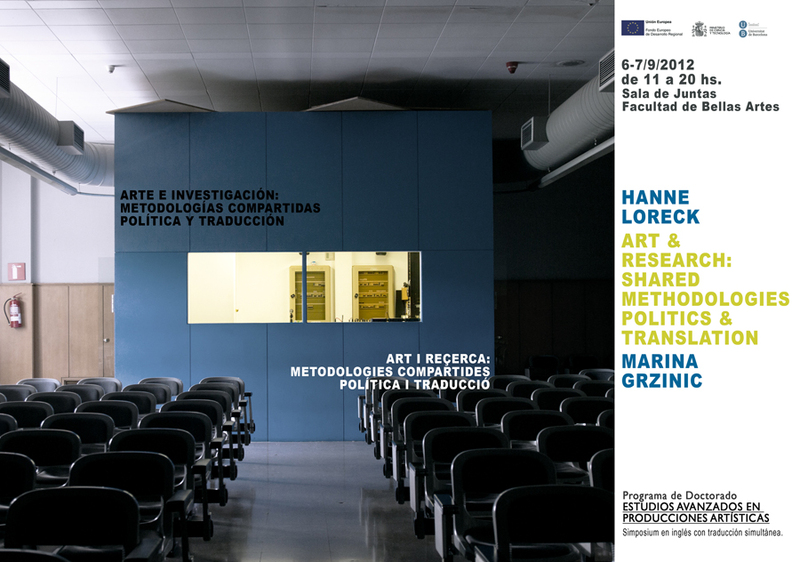 Este Simposio ha sido organizado por el proyecto de investigación I+D+i Metamétodo: Metodologías compartidas y procesos artísticos en la sociedad del conocimiento (HAR2010-18453) http://www.ub.edu/imarte/projectes/ y por los programas de movilidad del Doctorado con Mención de Excelencia ESTUDIOS AVANZADOS EN PRODUCCIONES ARTÍSTICAS. Es obligatoria la asistencia de todos las/los investigadores – doctorandos pertenecientes al mismo. Las profesoras visitantes Hanne Loreck y Marina Grzinic han sido beneficiarias de la subvención concedida por el programa de movilidad de la Dirección General de Política Universitaria. Esta entrada fue publicada en Información, Simposios. Ir al permalink.Tanto los comentarios como los trackbacks están cerrados.